Nearly a quarter million people working in San Diego County are at risk of being left behind because they lack workforce credentials that can advance them into good middle-class jobs. This week, an engaged San Diego audience—made up mostly of educators and workforce professionals—came together to explore the workforce problem and also an ambitious proposal to create a statewide online-only community college, California's 115th in the system. 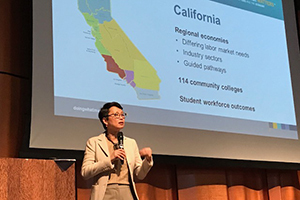 “California needs more and better workforce education,” said Van Ton-Quinlivan, the executive vice chancellor of the California Community Colleges at the San Diego Future of Work MeetUp on Monday where she highlighted Governor Brown’s proposal for the online college as one answer to that need. The focus was the millions of working Californians without the post-secondary credentials required to keep ahead of changes in the economy. The vice chancellor estimates that there are 2.5 million of them between the ages of 25 and 34 who fit into that category. You might ask, "Why aren’t they improving themselves?" Turns out the answer is complicated. Many can’t retrain because of work and family obligations, scheduling challenges, transportation time to campus, and affordability. In addition, about half of them come from Spanish-speaking households. 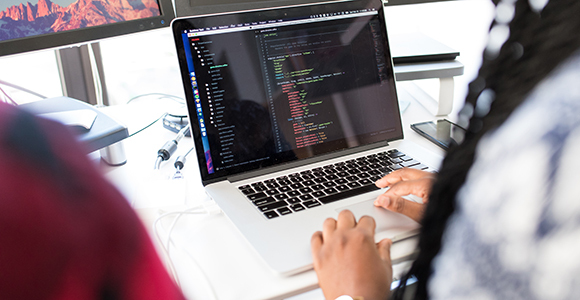 The online community college is being designed to allow them to go to school when they want, in their homes, and advancing as fast as they can without waiting for semesters. The proposed college is designed to benefit these students and will also help employers who have a desperate need for more middle-skill workers. In a poll taken of the audience, 72 percent of them believed automation will noticeably disrupt the local workplace. It’s estimated that 47 percent of U.S. jobs could be replaced by robots and automated technology within 20 years. New skills will be needed for the jobs that will change and the new ones that will emerge. Members of the audience agreed. “Technical ability will have to be added to all of our education,” said one workforce expert. A Grossmont College representative said that a newly revised curriculum would most likely have to be changed again in five years. Things are moving that fast in the 21st-century economy. Meetings like this have been happening across California and attracting. Local and regional leaders concerned over their workforce. Matt Sanford, the director of the San Diego Regional Economic Development Council spoke to the crowd and underscored the important of workforce development for the region. His group has been studying where the skills gaps are in San Diego. Sanford pointed out that despite the large Hispanic population is San Diego, only 19 percent of the tech jobs are held by Hispanics. He said it’s critical to the future of San Diego that there is an improvement in minority achievement. Andrew Picard from the event's co-host, the San Diego Workforce Partnership, echoed those concerns. The Partnership funds job training programs that empower job seekers to meet the current and future workforce needs of employers in San Diego County. Several more of the Future of Work MeetUps are schedule across California over the next two months. The California Legislature will vote on the online college proposal this summer.